In this series we’re introducing you to some of the Pangea Dreams Retreat hosts so you can get to know them and how they make our retreats special! In this post, we are getting to know Lauren from @wanderluluu! You can also learn more about Lauren on her blog! I was born and raised in Massachusetts, which is where I studied, lived, and worked until I was about 25. After 3 years of working in e-commerce fashion, I left my job and life in Boston behind to pursue my dream of traveling and blogging. So, I moved to Australia solo on a whim without a job, place to live, or any friends. It was quite the adventure that kickstarted my passion for solo travel and led to the creation of Wanderluluu.com, a blog all about empowerment through solo travel. It’s my goal to inspire women to take at least one solo trip in their lifetime, despite relationship status, to experience the personal growth and self-awareness it often yields. Now I split my time between Bogota, Colombia with my boyfriend, Massachusetts with my family, and traveling around the world where I work on Wanderluluu, run a small social media marketing business, and also work as the Retreat & Community Coordinator for Pangea Dreams! It’s kind of crazy how this little idea in my head to start a travel blog called Wanderluluu has come into fruition in this really big way. I started out having absolutely no idea what I was doing and to see how it’s grown over the past few years is really exciting for me. It’s important to note that when I really took everything to the next level however, was after attending the first ever Pangea Dreams Retreat in Bali back in February 2017. Yep that’s right – I was a participant on a Retreat!! I learned SO much about photography, growing my Instagram account, how to work with brands and hotels, and left with this new found sense of confidence. I left feeling like I could accomplish anything and I really used that momentum to take my blog/brand to the next level. Hands down without a doubt: the connections and lifelong friends you leave with. The workshops undoubtedly changed my life, don’t get me wrong, but what really stands out to me about Pangea Dreams is the connection amongst like-minded, inspiring women from around the world. The digital nomad life can be a lonely one because it’s such an unorthodox way of living, according to most. So to have a sisterhood of women that back me up and understand exactly what I’m going through is pretty amazing. It’s extremely special and is really something you have to experience to truly understand. My number one tip is to JUST START. I had the most difficult time starting because I was so afraid that it wasn’t going to be good or that no one was going to like it. But it’s okay to learn as you go, and trust me you will improve as you go! I look back at some of the first blog posts and Instagram photos I put up and it’s amazing to see the progress over time! That’s the thing – these things take time. Be patient with yourself and the process. It’s hard to say what my favorite part of this journey has been because each moment has led to where I’m at now! From perspective-changing solo travels through Southeast Asia, to reconfiguring my life and figuring out how to make my dreams happen, it’s been quite the ride, let me tell you! There’s so much uncertainty in this life, and there have been lot’s of ups and downs, but the main thing is that I stuck with it and now I am living my dream life. 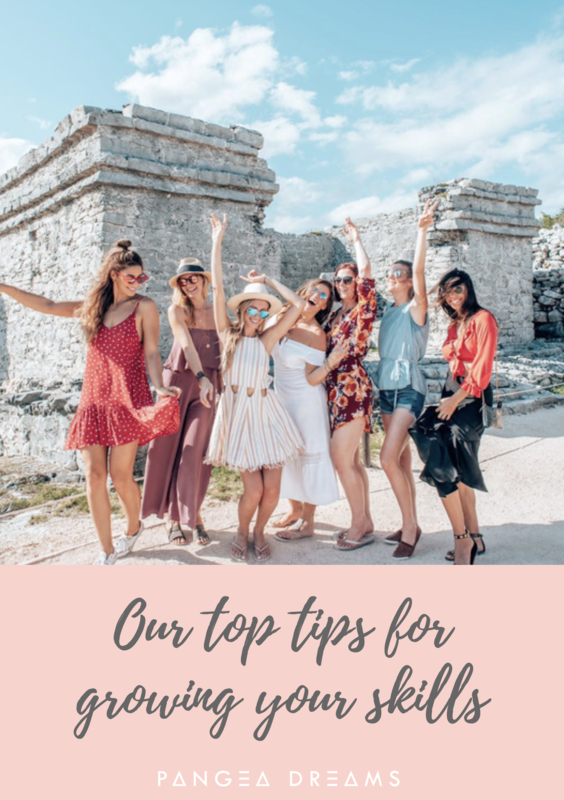 Truthfully, even if you don’t have a blog or have no specific goals in becoming a blogger or influencer, the Retreats are still extremely valuable. If you’re even slightly considering attending a Retreat, I really couldn’t recommend it any higher. It really did change my life. I teach Blog SEO 101 and How to Drive Traffic to Your Blog With Pinterest. I absolutely love teaching these workshops because the tips I’ll be sharing with the ladies have transformed my blog traffic over the past year! I’m still only a few years into this journey, but my growth over the past year alone has been exciting and I think it’s really encouraging to the girls to see that you can be a small account and still have success in the industry! Sign up to our email list and get our latest freebie: Our TOP Tips for Building your Digital Skills!